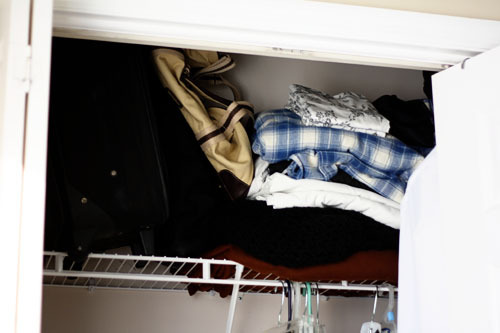 The office closet – the formidable, months-long task that it turned out to be – was unfortunately not the only downstairs closet in serious need of help. The guest room closet was also, until recently, filled to the brim and totally disorganized. I always wanted to have one of those half-empty guest room closets to allow houseguests to hang up their clothes, but never managed to do that. 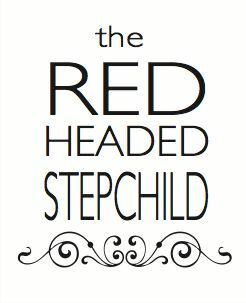 It’s probably a moot point because no one would want to stay that long anyway, due to my subpar hostessing skills in general. 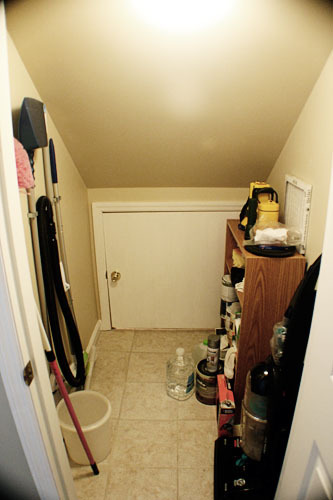 And now, the guest room closet needed to be cleaned out for – you guessed it – selling the house. Clearing out ten old formal dresses helped for sure, but I still had a ton of stuff stored on these rickety plastic shelves. Which, as you can see once I mostly cleared them out, was cobbled into a modified form that was perhaps twice as functional and fifteen times less stable. Why yes, that is a pile of leftover batting from the upholstered headboard, a lone misplaced photo storage box, random important documents that accidentally didn’t make it into the safe, a jumprope of mysterious origins, a space heater with a broken foot, and, uh, my wedding dress. Nothing but a place of honor for that! That brown one is a Snuggie. Because my mother loves me? That is not my footprint. I assume it belongs to the little girl who previously slept in this room, two-owners ago, who also apparently wanted the trim in her bedroom painted bubble-gum-pink. Traces of that linger, too. 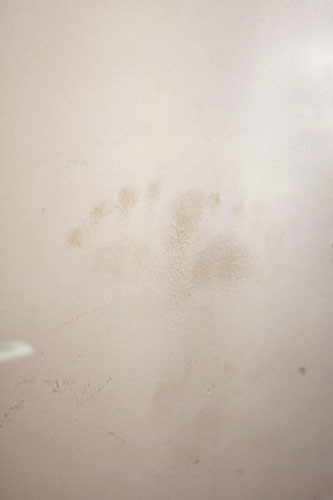 No, the footprint would not come off the wall. Yes, I probably should have painted the interior of the closet. OR: I could just stack boxes in front of it. Hey, it worked the last two times the house was sold! Anyway! You may be wondering where all the stuff is going from the closets, since closets are clearly the place that you and me and everyone else keep all our junk. Sure, a lot went to Goodwill and the trash, but what about everything else? And how about those crazy-lady box towers? Where did all those boxes end up? Certainly I didn’t throw them out after hoarding so many wonderful, precious boxes? 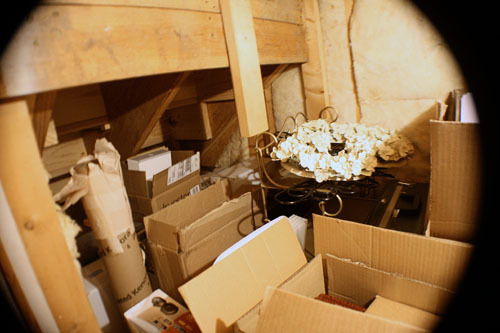 Allow me to introduce you to my cupboard-under-the stairs. That’s right. I have a Harry Potter bedroom. 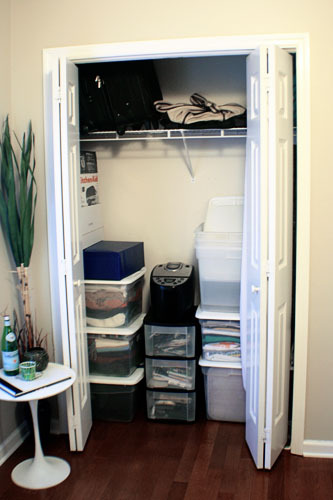 This closet got purged and cleaned and organized last week as well, but I forgot to take a photo of that. 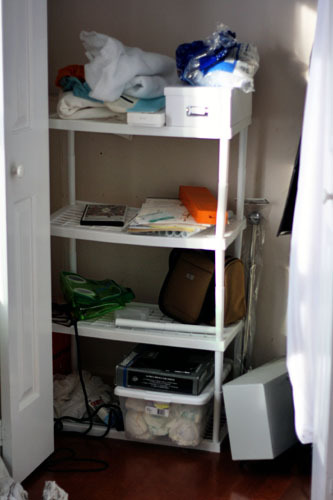 It was a less stunning before-and-after anyway, because I cleaned out this closet last year when I painted it (not because of bizarre dirty wall-footprints, but just general original-paint grodiness). Having all that extra storage space is pretty darn fantastic, right? 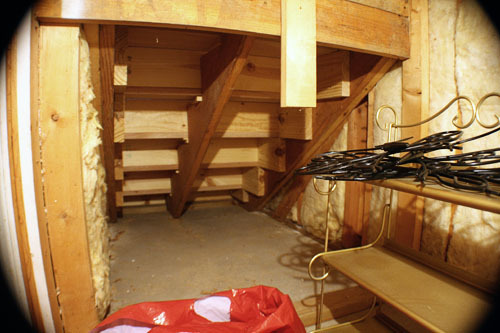 Because of this space, I have never, not once, used my attic. But what those photos don’t fully convey is how incredibly dirty and creepy it was. It’s actually a nice-sized space – maybe three by five feet, plus the space under the stairs, and tall enough for me to sit inside without worry of bonking my head. But it was so, so dirty. It was still full of sawdust from when the previous owners installed the hardwood staircase, as well as a residence for a few eight-legged roommates. Shudder. So the first order of business was clearing out the few things stored in there, followed by some intense vacuuming. Then, once I’d eliminated the cobwebs above and the dirt below, I filled it back up. And I mean filled. 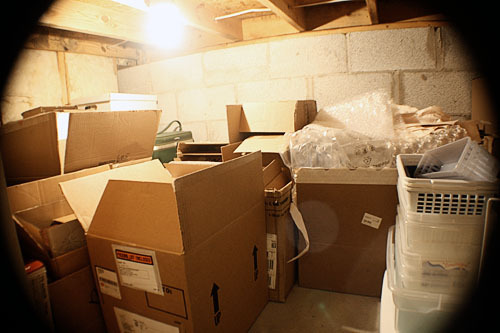 But here’s the thing: most of those boxes are empty. Just boxes inside boxes inside boxes. There’s maybe two full boxes of random things from the office and guest room closets, but the rest are just waiting to be filled. Actually, that big box just inside the doorway is already filled, but entirely with packing material I’ve collected over the years. YES MY CRAZY LADY BOX-HOARDING EXTENDS TO NEWSPRINT AND TISSUE PAPER. Sure, you can make fun, but you’ll be sorry when you need bubble wrap. So that’s how I spent a good part of my spring break: actually dealing with all the crap I’d spent years shoving into our plentiful storage space. 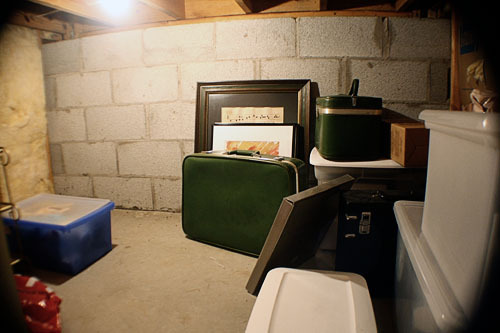 It was a thankless task in many ways, but four trips to Goodwill and many full garbage bags later, I’m finally feeling pretty darn good about our storage situation – and much happier about having fewer things to move!